The following terms and conditions apply to the use of this website and by accessing this website and/or placing an order, you agree to be bound by the terms and conditions set out below. If you do not agree to be bound by these terms and conditions you may not use or access this Website. All other terms and conditions including those in any order submitted by you are expressly excluded and shall have no effect. All purchases must be paid for in full before delivery. Sock Solutions Limited will continue to own, and reserve the right to repossess any goods sold from its Website until payment has been received and cleared in full. Payment will be taken at the time of despatch, not at the time of order. All prices quoted are for new products (unless stated otherwise) and are priced in Great British Pounds (GBP) including all taxes at the current rate. All delivery times are given in good faith. Sock Solutions Limited accepts no liability for delays resulting from occurrences outside its control. These include, but are not limited to: acts of God, strikes, lockouts and delays by suppliers. We are not able to guarantee timed delivery. 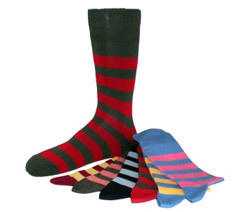 It is the customers responsibility to inform Sock Solutions Limited in writing of any change of delivery address. We will take all reasonable care, in so far as it is in our power to do so, to keep the details of your order and payment secure, but in the absence of negligence on our part we cannot be held liable for any loss you may suffer if third party procures unauthorised access to any data you provide when accessing or ordering from the Website. You should be aware that if requested by the police or any other regulatory or government authority investigating suspected illegal activities to provide you Personal Information, we are entitled to do so.